Louis XIV, the Sun King, expanded and embellished Louis XIII's modest Versailles "hunting lodge" palace into Europe's grandest royal palace. In 1682 it became the seat of the French government. Louis XIV spared no expense (and nearly bankrupted France) in adorning his pet building with the finest furnishings to impress his subjects and foreign dignitaries. His lavish balls with fashionably dressed men and women were legendary. So were his epicurean dinner parties. He was King Louis XVI, who succumbed to the French Revolution and the guillotine. Versailles's physical magnitude astounds visitors – it was once home to thousands of nobles, bureaucrats, soldiers and servants. To give you an idea of its size, consider that the stables alone held 2000 horses. The most renowned chamber is the Hall of Mirrors, so named because the light from the 17 tall arched windows on one side of the room is handsomely reflected by the corresponding arched mirrors on the opposite wall. This hall is embellished with fine art and chandeliers. 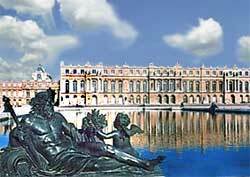 They also define grandeur, as do the immense Versailles gardens dotted with statues and fountains.